I wrote this for the mass moca blog, but they never posted it. I don’t know why. Last December I was sitting in a pizza parlor telling my friend Sarah about the position I’d applied for at MASS MoCA. Before I could say any more she bursts “Great! I’ll bring my students up there.” Sarah Sandman is a professor of design at Hostos college in the Bronx, New York. Like most great teachers she thinks the world of her students and had been searching for an opportunity to pull them out of their day-to-day structure and explore what makes the creative life worthwhile — work and play. Further discussion developed. What resources would they require? What would the focus be? Would the students freak out? The proposed dates lined up nicely with Bureau for Open Culture’s Work Site — a public, social space for freelancers and work-from-home types. Headquarters would be established there. Naturally, the current exhibitions at MASS MoCA influenced the student’s investigation. The objective was to both ask and answer “what is a cultural worker?” (à la The Workers) As well as to create something from readily available, found and scavenged resources (Nari Ward). 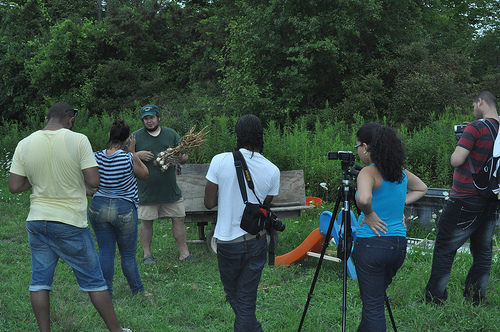 Week one of the two-week residency was spent setting up shop and gathering data. The students broke into two teams and met local artists, musicians, dancers, artisans, and farmers to ask them if they were cultural workers. Individual students worked as reporters, filmmakers, photographers, and sound engineers. Saturday brought both the mid-point of the residency and August Heffner, creative director at MoMA in New York. August and myself spend the day with the students talking about their week. We were delighted to hear their interpretations of cultural work, and could see they were exhausted. August gave them a partial break and lead brainstorming exercises based on MASS MoCA’s Sol Lewitt Retrospective. In the afternoon we pinned down a plan for week two. The next few days were split into working on a collaborative project and a personal reaction. Thursday night was the official opening. Work Site was transformed from a jumble of tables, laptops, sketches and scribbles to a gallery documenting a journey. As a patron I was impressed with the effort. As a (minor) participant I was proud of the accomplishment. I want to thank all the participants from the Bronx for choosing to work at MASS MoCA, and the Berkshires interviewees for opening their studios and lives. 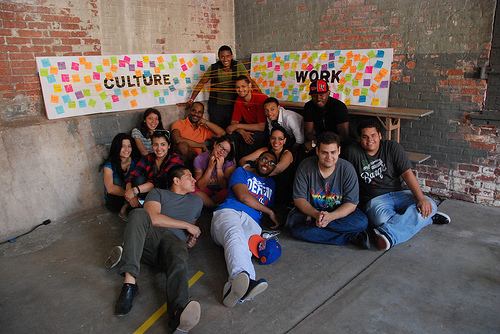 Explore the Hostos DesignLab.